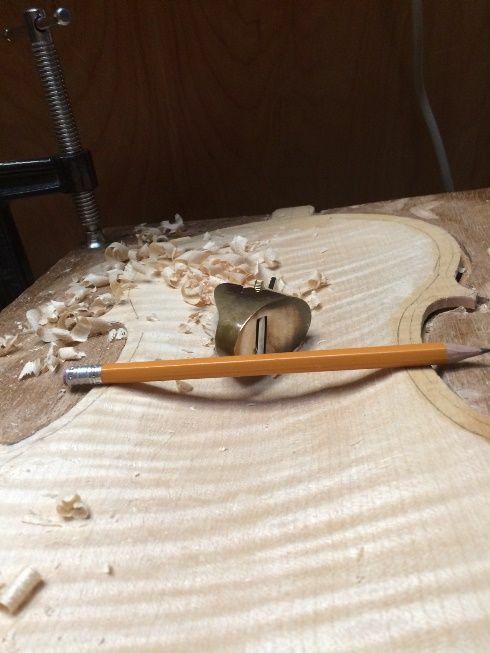 Graduating hard maple can be a tough, laborious job. 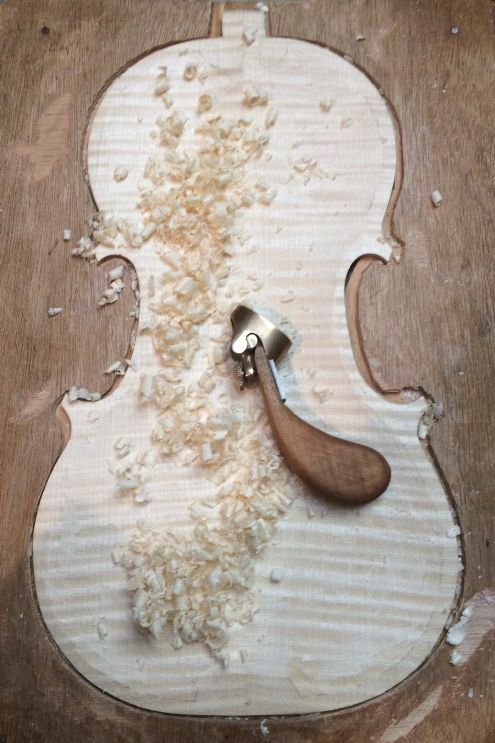 Besides, there is always the possibility of carving too deeply and ruining the plate. So, I try to cut the risks by creating a “map” by marking the thickness every few centimeters, and then carving the “dots” until each “dot” is about the thickness I want. 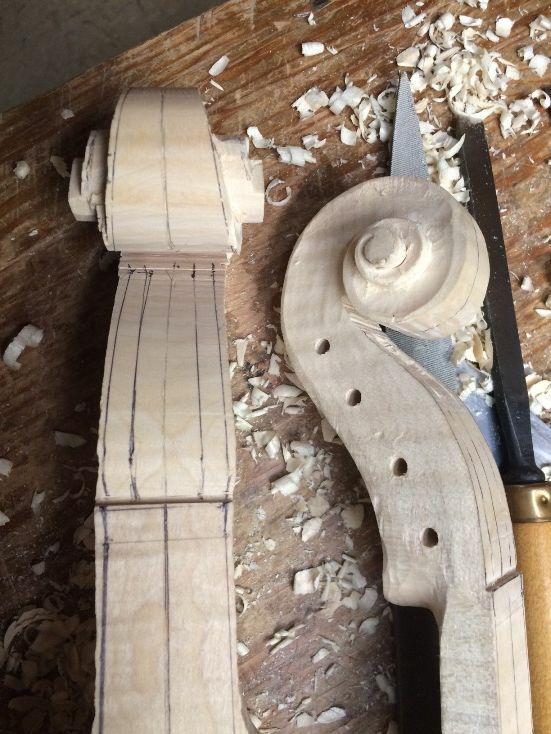 Finally, I connect the “dots”, using planes and scrapers, checking for thickness as I progress. Creating the dots. The circled numbers are already the correct thicknesses. Checking thickness. Pretty thin plate! 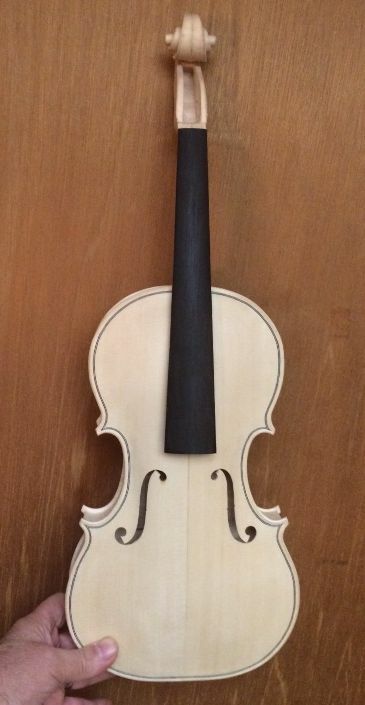 Completed back plate with neck-grafted scroll. The heel was still not shaped. 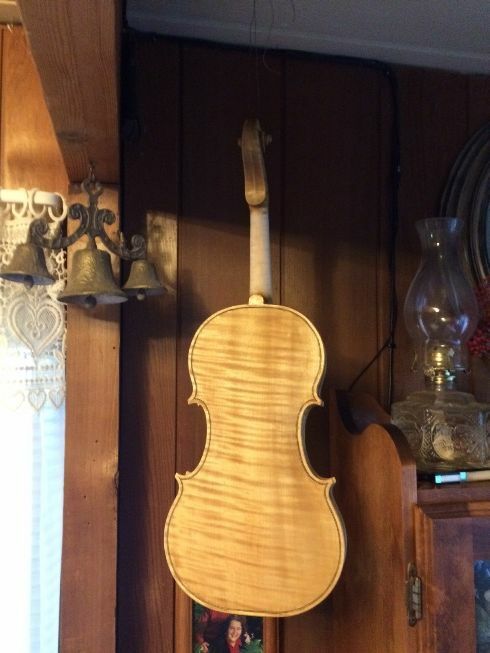 I had been anxious to complete the back plate, and had not yet set the neck. 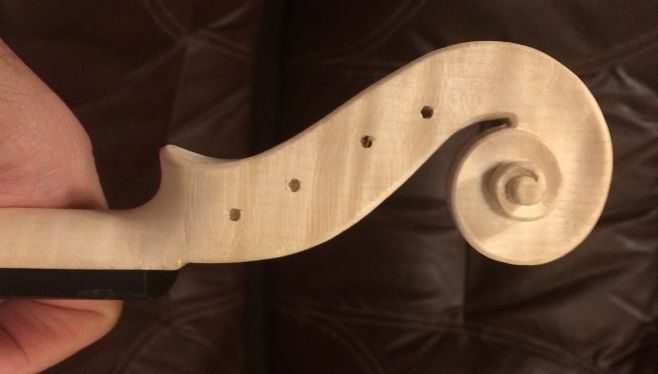 So I completed the neck and installed the fingerboard. 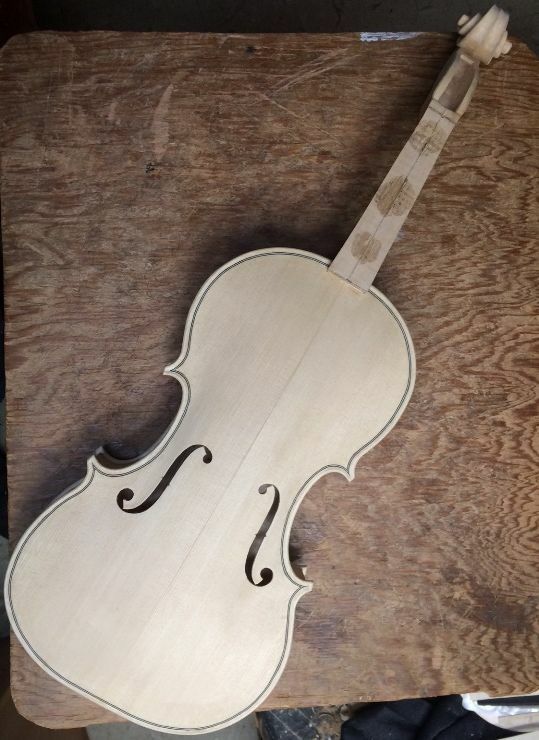 Next I set the neck, so that the angles were all correct. 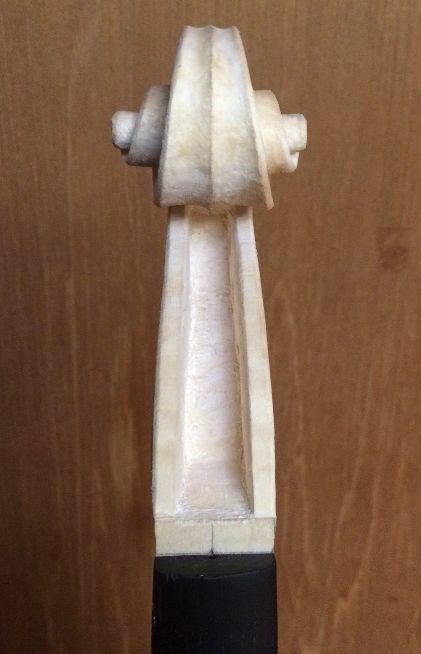 Neck-set, front view. The mold is still in place. Neck-set, side view. 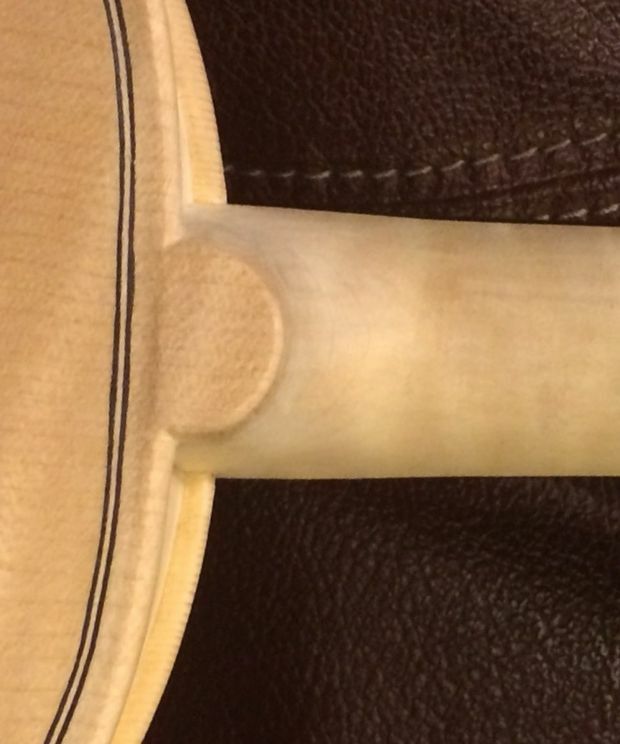 Notice that the neck heel has not been trimmed flush, yet. Then I removed the mold, and installed the inside linings on the back edge of the ribs, shaped the linings and the blocks, flattened the back of the garland, and installed the back plate. 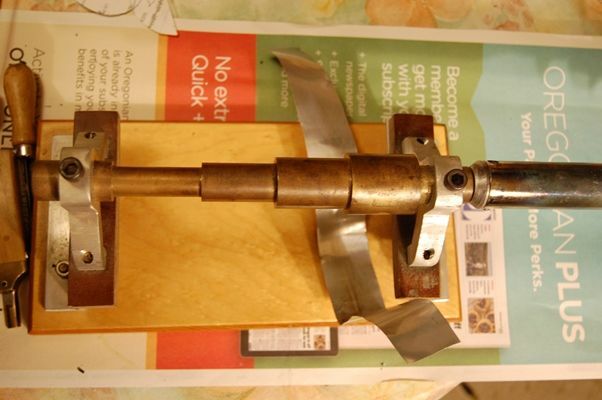 I use spool clamps and a single large spring-clamp to close the corpus. My wife thinks the spool-clamps look like old-fashioned hair-curlers. Closed corpus with spool clamps and a spring-clamp. 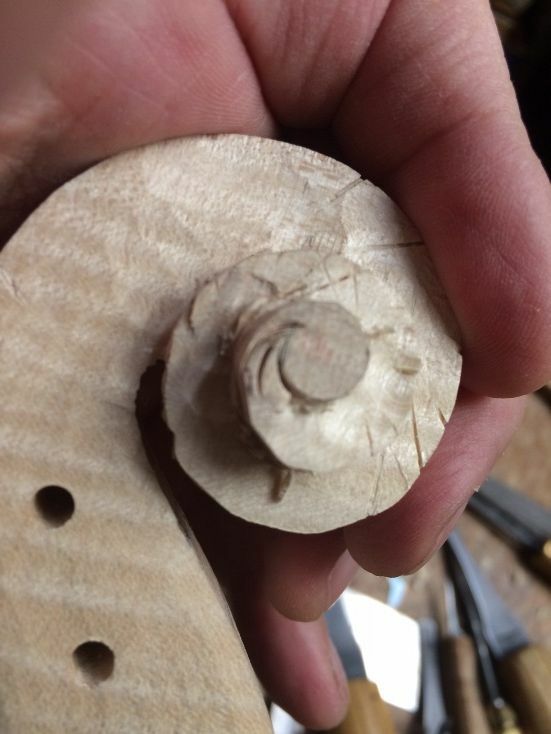 Once the glue was dry, I removed all the clamps, cleaned off any glue that had squeezed out of the joint, and trimmed the button and heel. 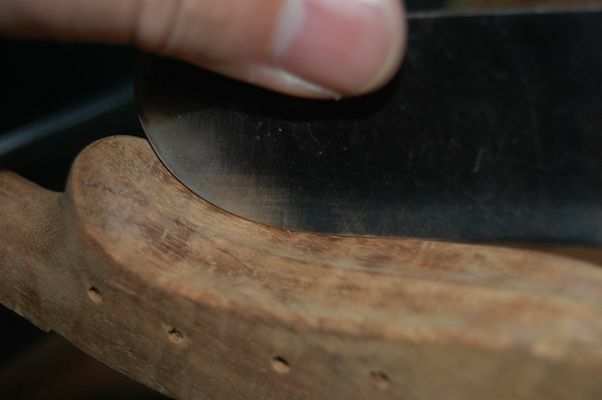 The dimension from the juncture of the top edge of the front plate and the side of the neck heel (from each side) to the very center of the curve of the heel, should be right at 26 mm. 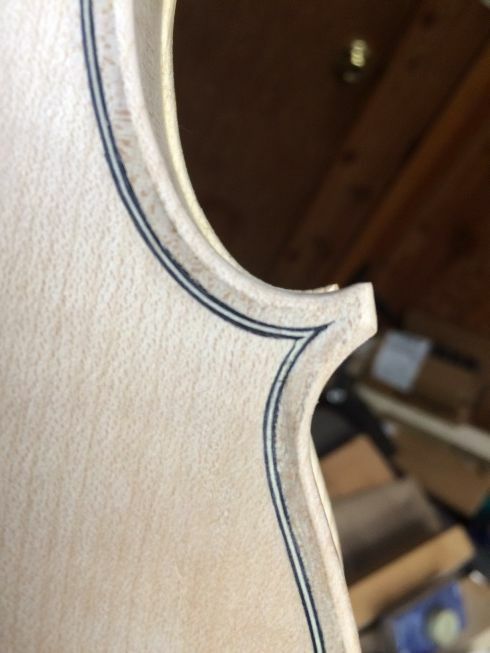 You can see the two marks I laid out with a compass, testing that distance: it was still a little too high in the center of the curve, so the neck needed to be trimmed a little more. Ready to trim the button and heel. 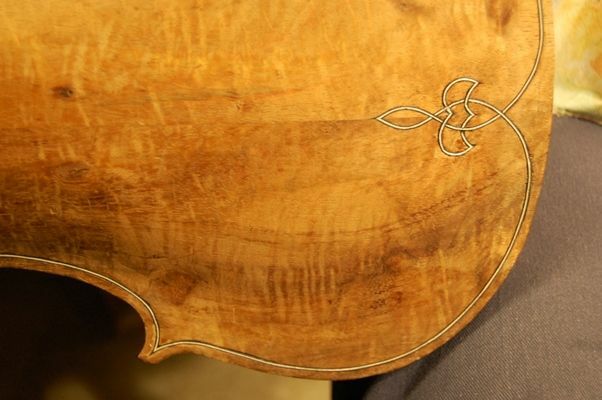 Once the neck-heel and button were trimmed, I still had to perfect the outline of the back plate, making certain that the overhang was even all around, as much as possible. 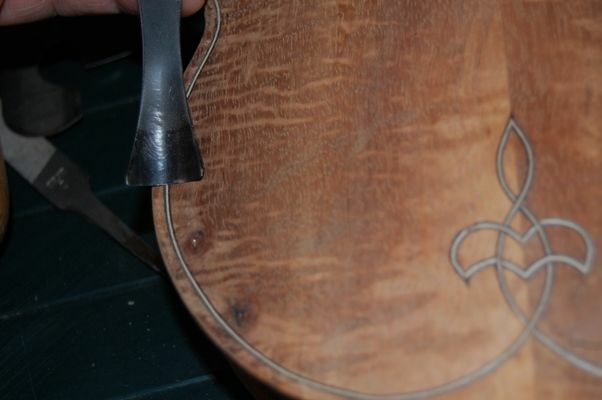 Then I laid out the purfling slot, using a purfling marker, and began incising the outlines of the slot. 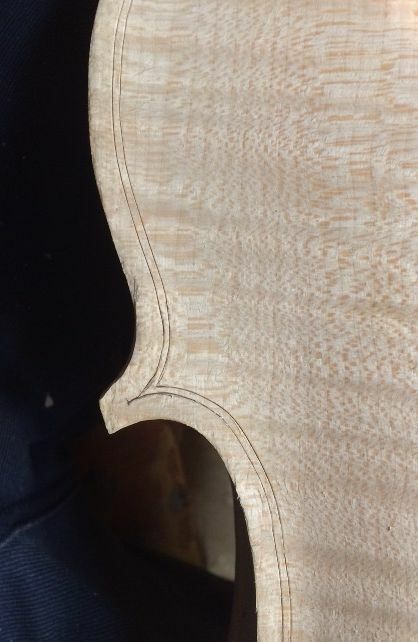 Incised purfling slot. 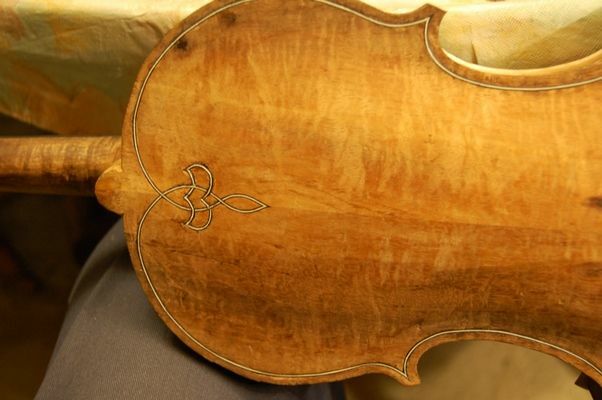 It will be corrected, and fine-tuned as I work, and look good with the purfling. Next I cut the slot out, using a small knife and a purfling pick, then dry-fit the purfling, after bending it on the bending iron. Finally I glue it in place, using hot hide-glue. 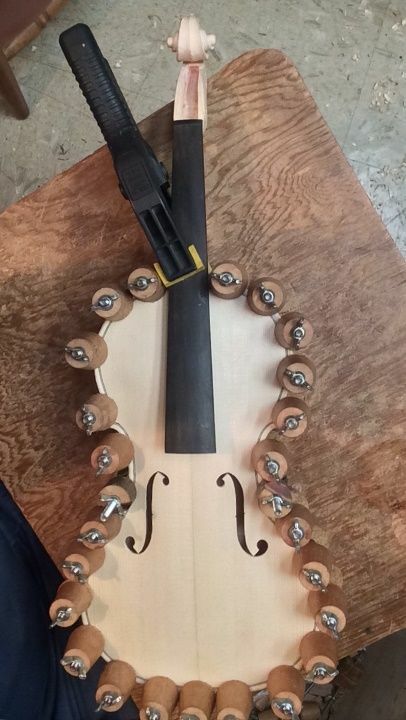 Purfling installed, and glued in place. 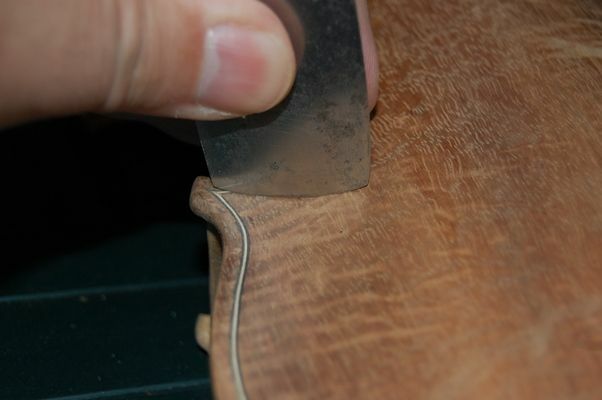 I marked a crest-line, about 1.6 mm in from the outer edge, then used a gouge and scrapers to carve the channel, and fair it into the plate surface. 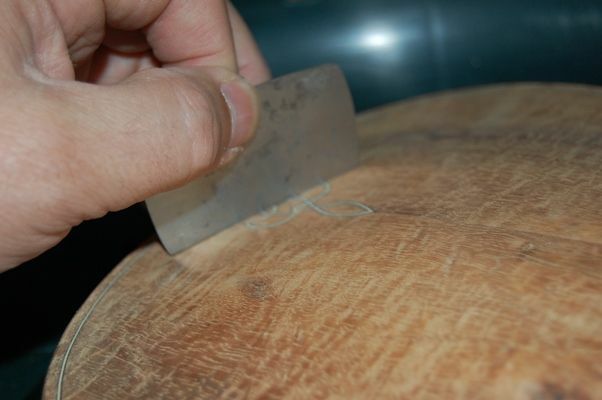 The edges were all still quite rough,and crude, so I began shaping them, using a small plane, and a half-round file, then sandpaper to get a smooth edge all around. I don’t use sandpaper much, but this is one place where it is appropriate. 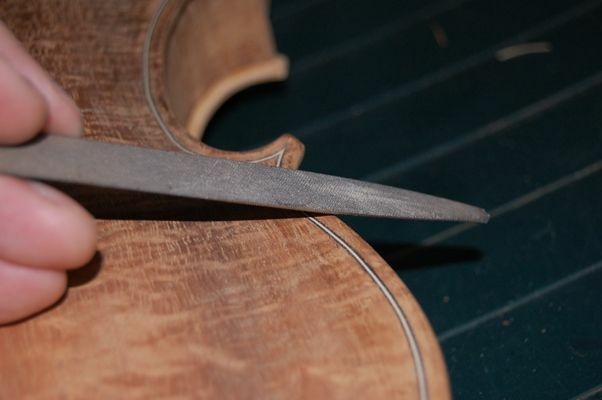 Trimmed purfling, smoothed channel, and edges taking shape. The front edges have to be finalized as well. 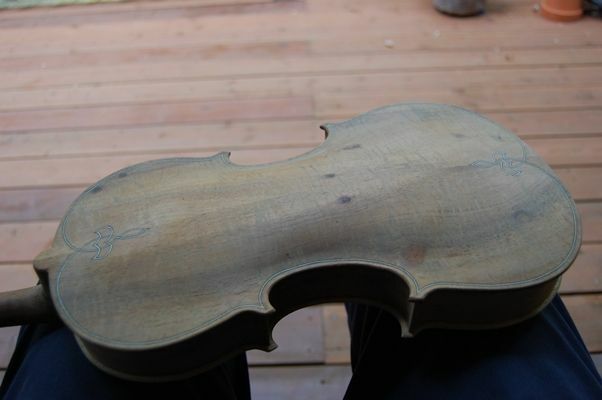 Once all the varnish preparation is complete, I brush a coat of coffee all over the instrument, to tan the wood a little, and raise the grain. 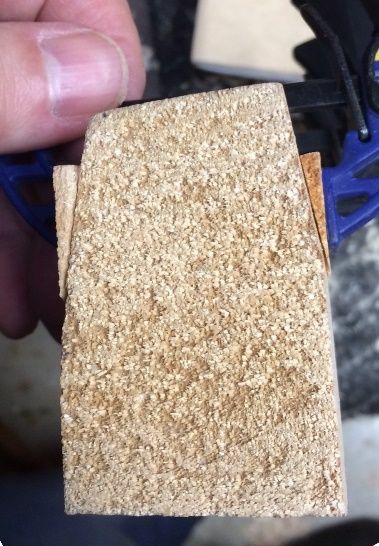 When that is dry, I sand off most of the raised grain, using 400-grit sandpaper. This ensures that the grain will not raise too much during application of the spirit varnish, later. Afterward, I rub in a coat of gypsum in a coffee suspension, to fill the pores of the wood with particles of the mineral. 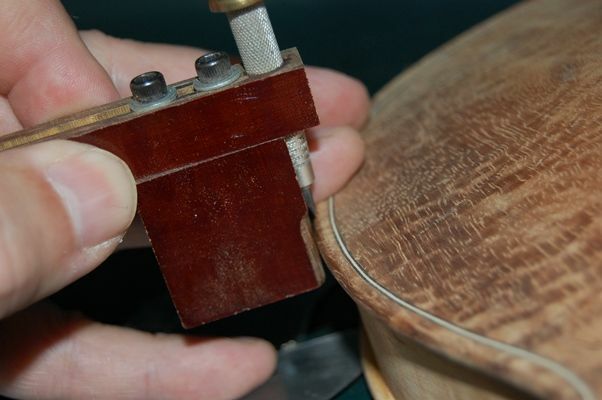 This keeps the varnish from saturating the wood, and possibly dampening the sound. Mineral ground drying. 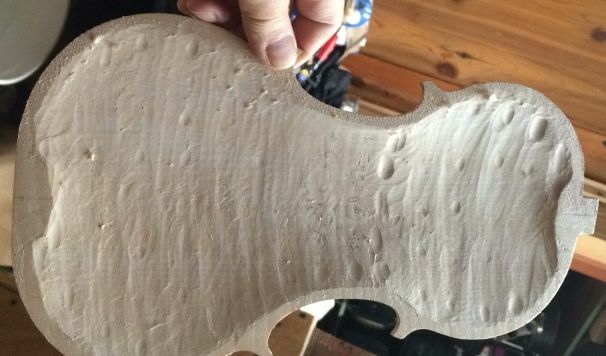 See how it obscures the wood? that goes away when the sealer is applied. The sealer renders the mineral ground transparent, and it will never be visible again. I expect that, by tomorrow, the sealer will dry sufficiently that I can begin varnishing. 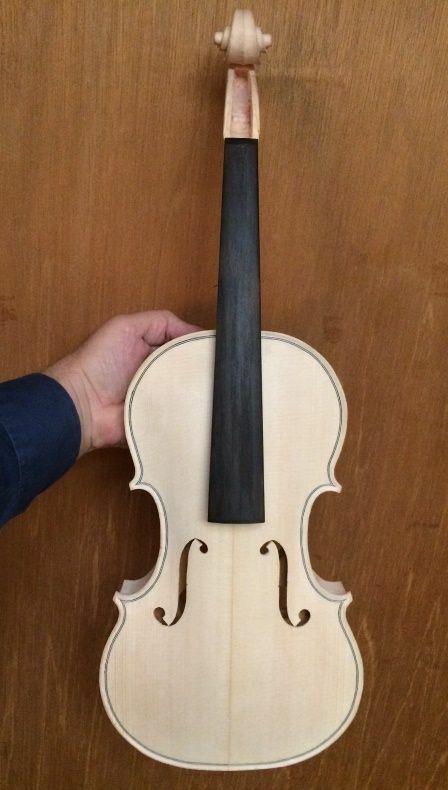 I am getting anxious, as the show is a week from tomorrow, and I am far from completing this instrument. 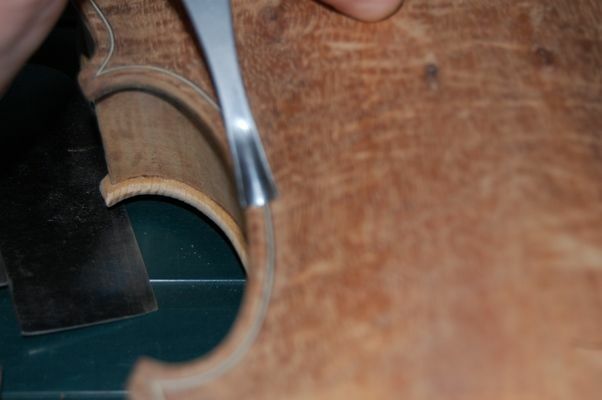 Completing the graduation of the Back plate on the Titian Strad copy. Once the graduation was complete, I removed the interior form (sometimes called the “mold”) from the garland, and trimmed the blocks and linings, so that the garland and back plate could be joined. I had already flattened the back of the garland, so this was a pretty simple step. Graduation complete: ready to close! I aligned the plate on the garland as closely as I could, dry, then began applying clamps to hold it. I adjusted the position slightly as I progressed, so that when I finally had clamps on all corners, and in the center of each bout, the position was exactly what I wanted. Then I began removing two or three clamps at a time, and slipping hot hide glue between the plate and the garland, using a thin palette knife. I quickly replaced the few clamps I had removed, and more clamps between them, so that the section was securely attached. Then I moved to the next section and repeated the process, until there was glue and clamps all the way around. 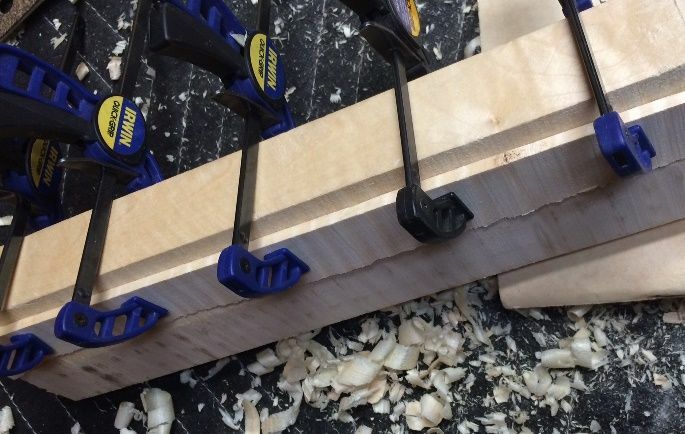 I saved the neck block for last, because I intended to add that larger clamp, and it would have been cumbersome, had I used it early in the procedure. Closed, clamped, and resting overnight. 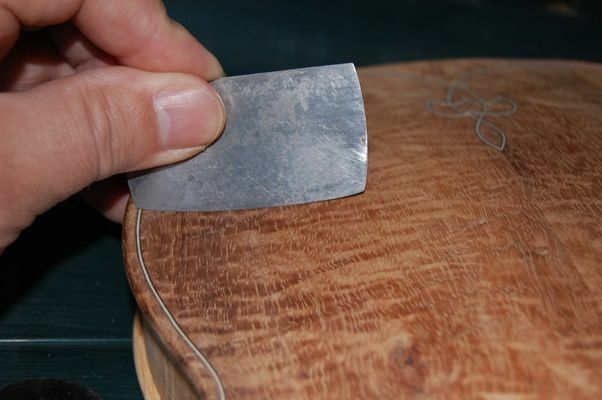 I allowed the glue to dry overnight, and, in the morning, I removed the clamps and began carving the heel, and working on the edges of the back. Closed, but a long way from done. 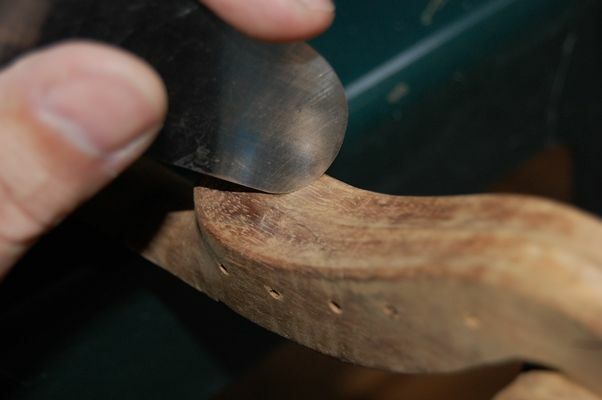 Shaping and scraping the heel. Ready for varnish prep. Front view. Ready for varnish prep. Back view. 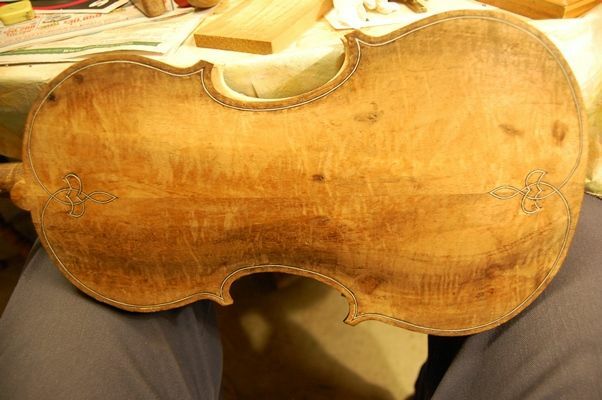 Full Front view: ready for varnish prep. 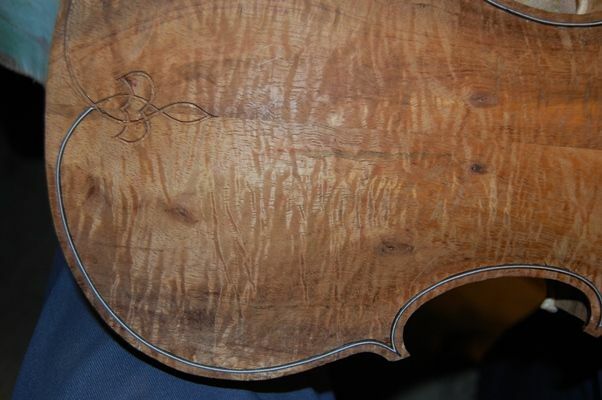 Full Back view: ready for varnish prep. This morning I got back to work on the scraping, and completed the outside of the front plate. The interior is also essentially complete, but still lacks the bass bar, so there is still that to do. I spent some time cleaning up the f-holes, and I am somewhat satisfied with them, but undoubtedly will do some tinkering later, just because I always do, and am never quite satisfied with them. 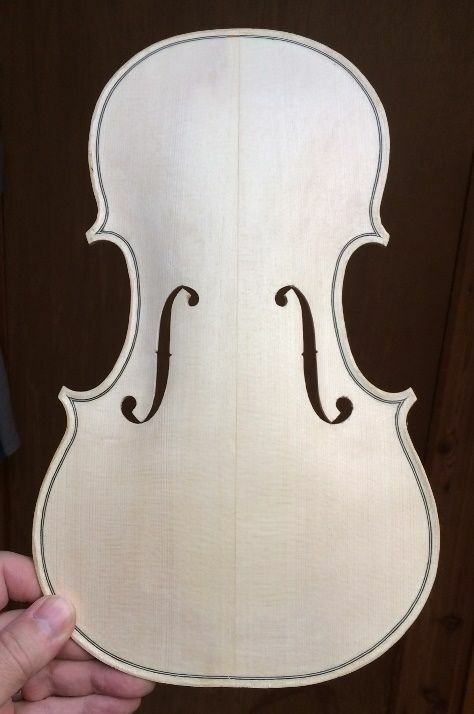 I knew I probably needed to get going on the neck, but I really wanted to begin the back plate graduations, so I started in. This is about as far as I got. I will probably complete it tomorrow, but my hands were getting tired, and I needed to do something easier for a bit. You may recall that the neck block had been delivered to me in a trapezoidal cross-section. 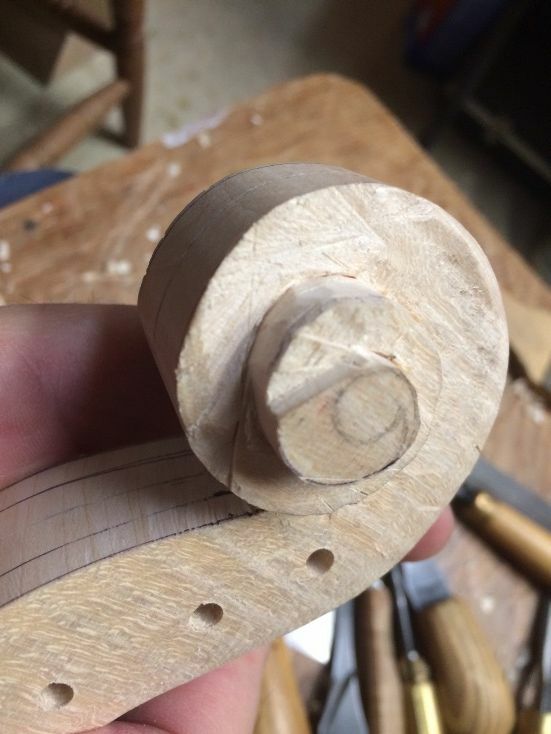 This is quite common, but it poses a problem for me, because, once I have the side profile of the scroll and pegbox laid out, I prefer to drill a pilot hole for each peg, using my small drill-press, so that the holes are all perpendicular to the centerline of the scroll. That is hard to do, with a sharp angled shape. So, I set my bandsaw for 1/4″, and sawed off a triangular slab from each side of the big end of the trapezoid, reversed them, and glued those slabs back onto the sides, near the thinner end of the trapezoid. I checked with my little square, to make sure I had them at an appropriate location, then clamped them home. 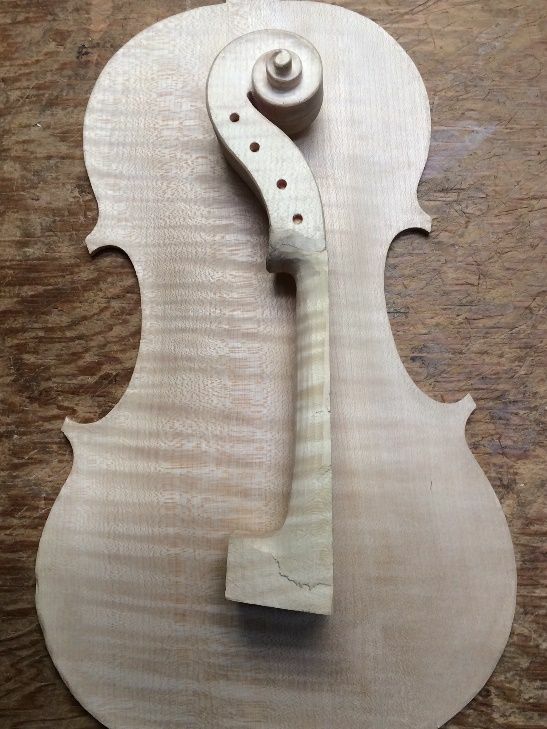 Once the glue dries, I will square up the block, lay out the neck, drill the holes, and get going on carving the neck. 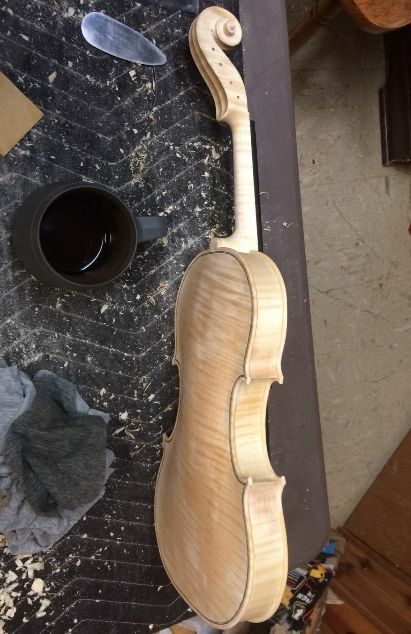 Those wedges will be completely removed, long before the neck is done. 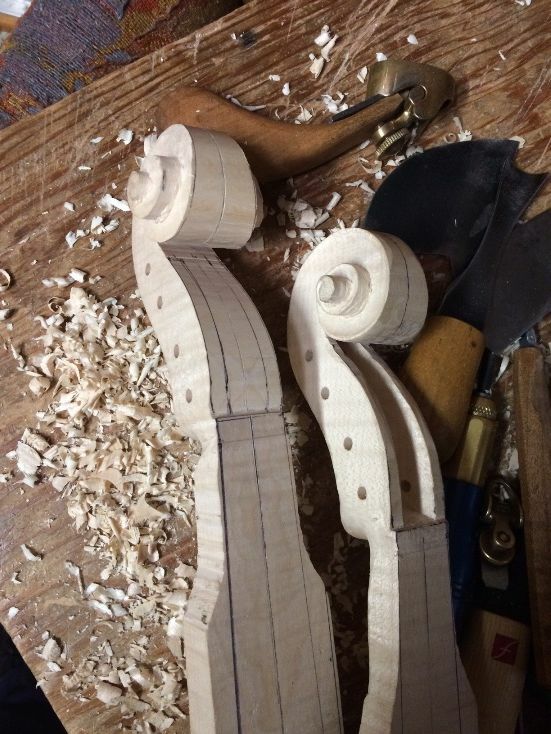 Slabs removed and rotated up, making it possible to square up the neck billet. Slabs glued and clamped. 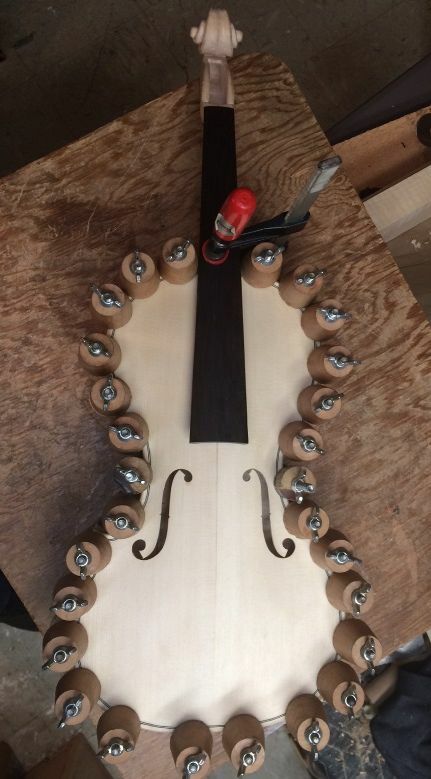 When the glue is dry, I can square the billet, and proceed with neck layout. Ann and I decided to take a break and go for a walk, as Spring seems to have arrived early. 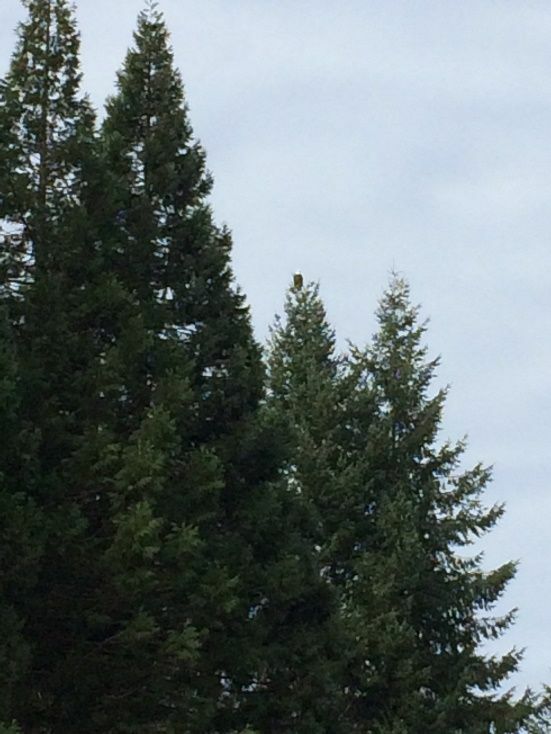 As we neared home again, a pair of Bald Eagles passed by, flying low over our place, and landing in the trees at the front of the property, on the far corner. I had never before heard eagles “chatting” with one another. It was interesting hearing their clear, high-pitched chirps, and whistles, as they “talked” back and forth. One of them almost immediately re-located to a thicker stand of trees across the road, but the other obligingly remained in sight, preening herself, until a passing hawk began diving at her, and she, too, moved into the thicker cover. I only had my cell-phone, but I did manage to get one photo. Once the glue was dry, I could square the billet, by sanding or planing off excess wood. Removing those slabs had left me with a few milimeters extra on the thickness, and much more on the depth, from front to back. So, since I had tried to plane it, but it tore out badly (as curly maple frequently does) I straightened the sides using the oscillating spindle-sander, and then laid out the neck details. 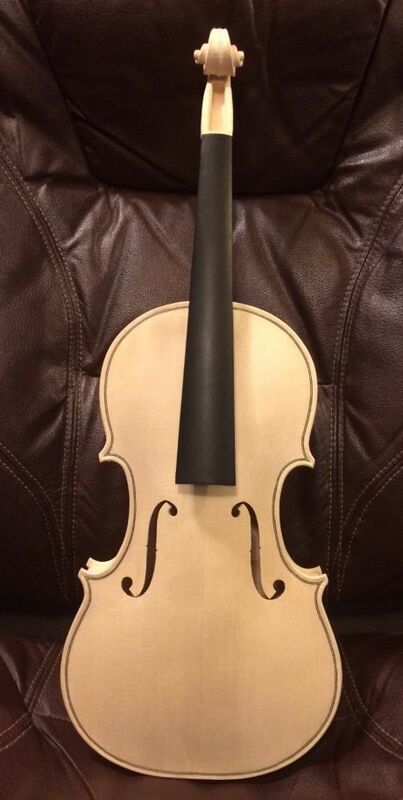 I have made a new neck template, but it is just thin plastic. I will eventually make a light aluminum template which will be more durable. I first laid out one side, including the locations for the peg holes. 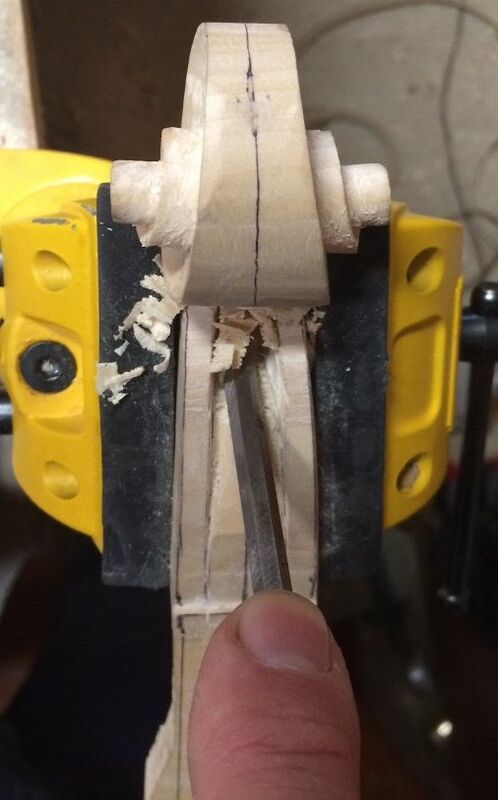 Then I drilled the 1/8″ pilot holes for the pegs and cut the profile out on my small band-saw. 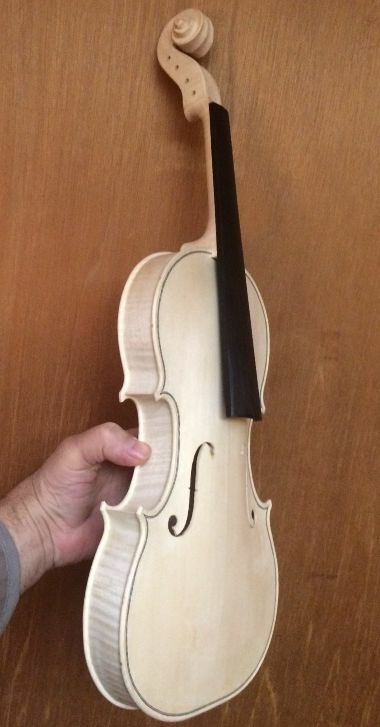 After that, I was able to lay out the other side, and all the rest of the details; including the width of the heel, the width of the button, the width of the neck at the nut, and the taper of the pegbox into the actual scroll. 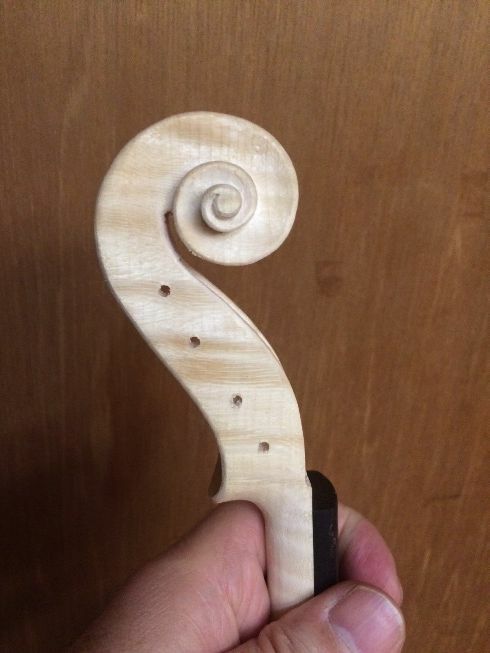 I cut tangents to the curves, down to the scroll outlines from both sides. 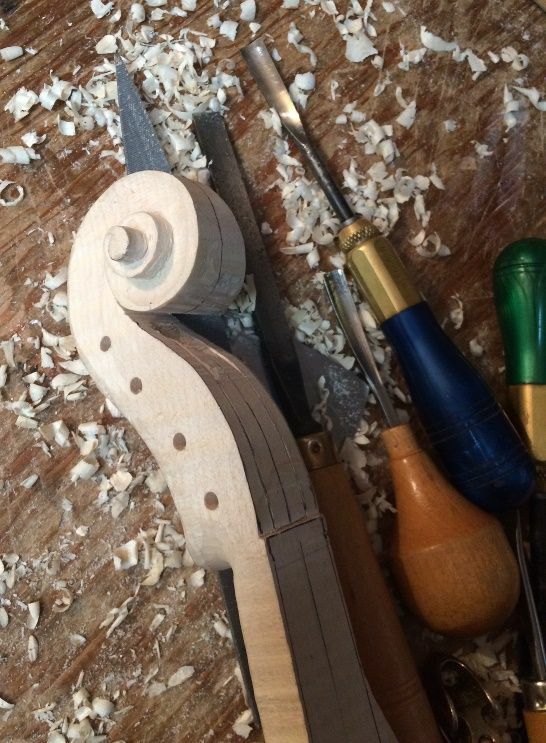 Once I have cut sections all the way around, I can easily remove those sections and begin carving. 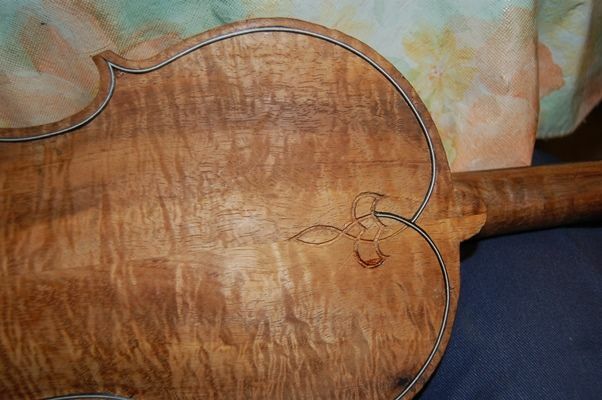 I will try to complete the back plate, the bass-bar, and the neck/scroll tomorrow. 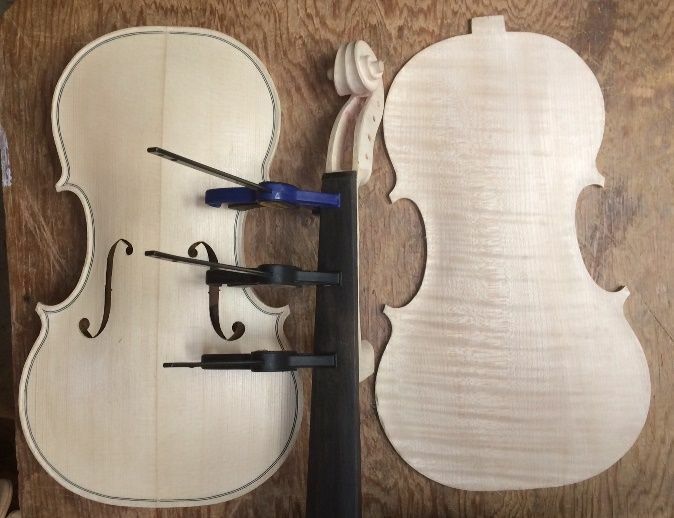 If I get that far, I will feel as though I am “on the home stretch,”, as the neck-set will then be the only difficult step left to do. We’ll see, though. There may be other priorities to pursue. The outside arching for the front plate is essentially complete, though there will be a lot of scraping, later on. 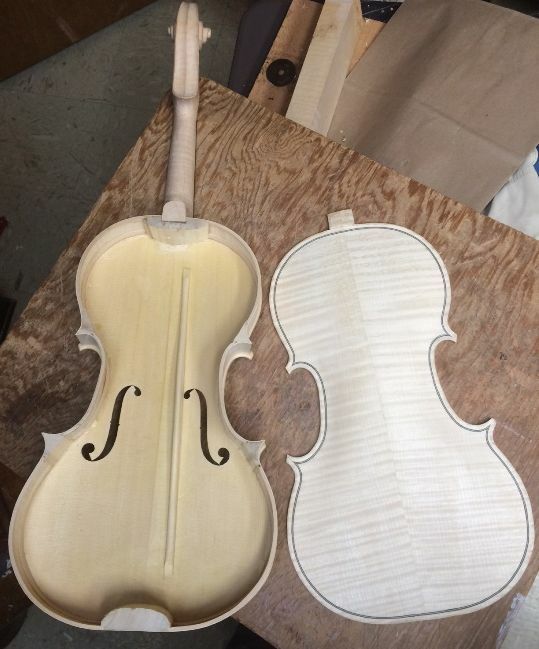 I began the graduation (inside arching) of the front plate about the same time as I took off and “sprinted for the finish line” with the “Plowden” Guarneri-model violin (see recent posts), but all I accomplished was that the center of the plate is about the right thickness– everywhere else it was still way too thick. So! Back to work! 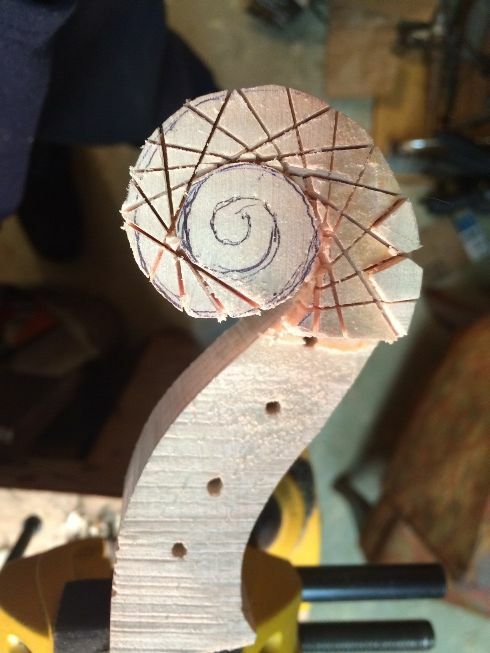 You can see (below) that the f-holes have been laid out and deeply incised, which allowed me to accomplish the last stage of the front arching (explained in an earlier post.) 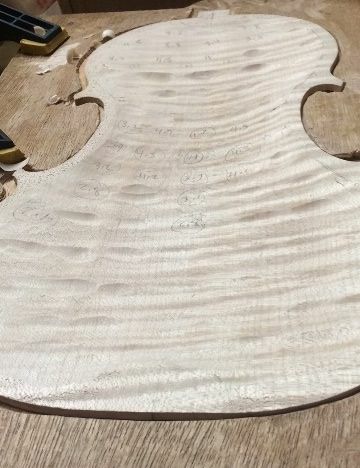 Now I need to carefully carve away the interior, until all the plate is the thickness I want it to be…which varies by region, all over the plate. 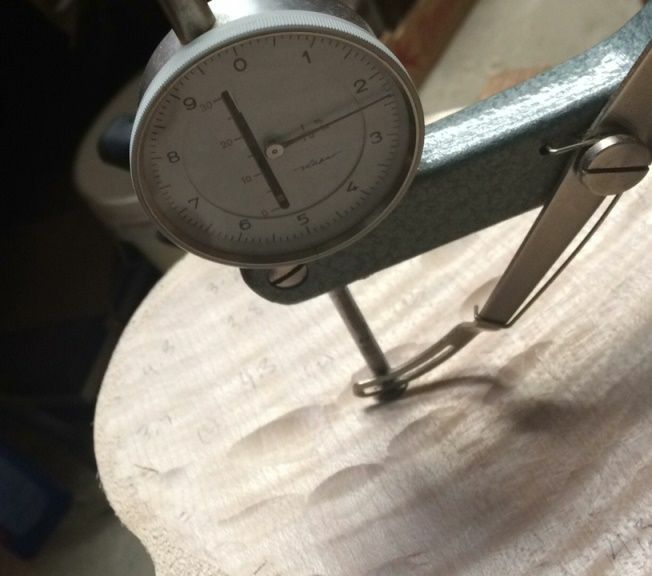 I have to be very careful to check certain areas with a caliper before I begin to carve, or I may easily go too far and make the plate too thin. (Voice of sad experience….) 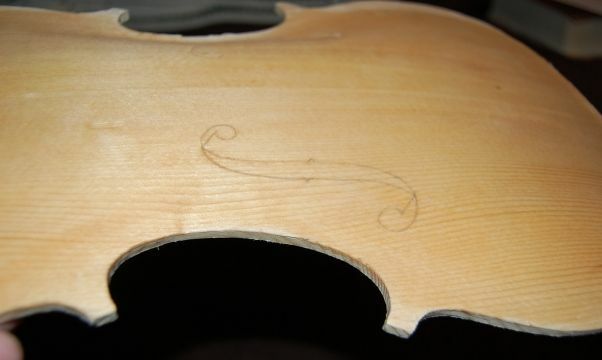 The area around the lower ends of the f-holes are very likely victims of this error, so I try to check regularly, and avoid carving away too much in those areas, especially. 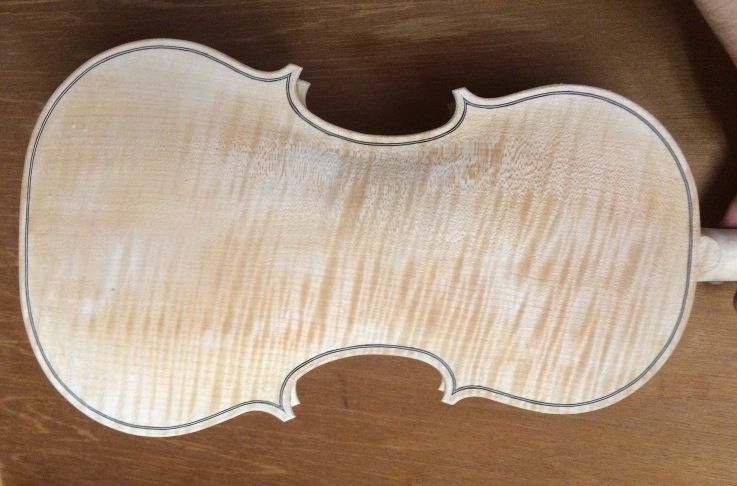 The outer arching of the small viola is complete, not counting the purfling channel. 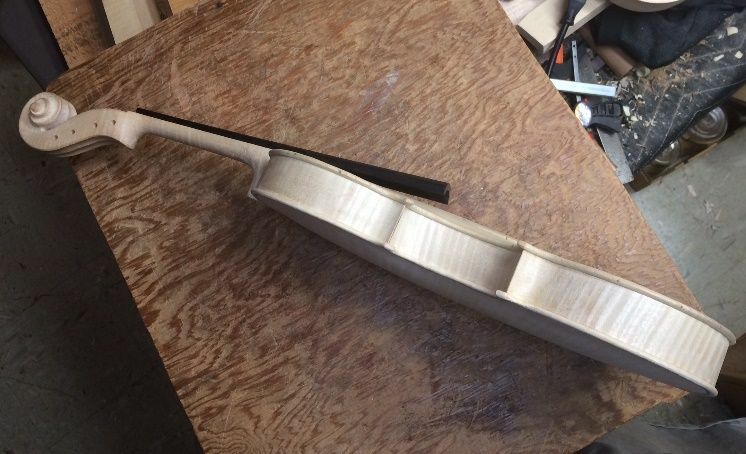 Side view of the small viola’s arching, before purfling and edgework is done. 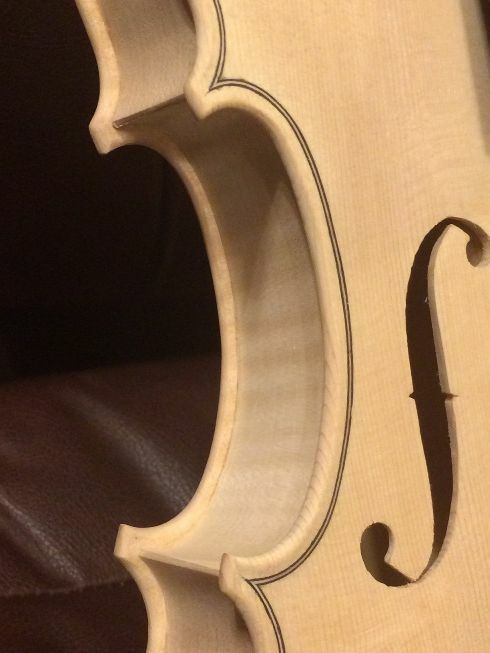 Inside arching of the small viola. The Graduation is complete. 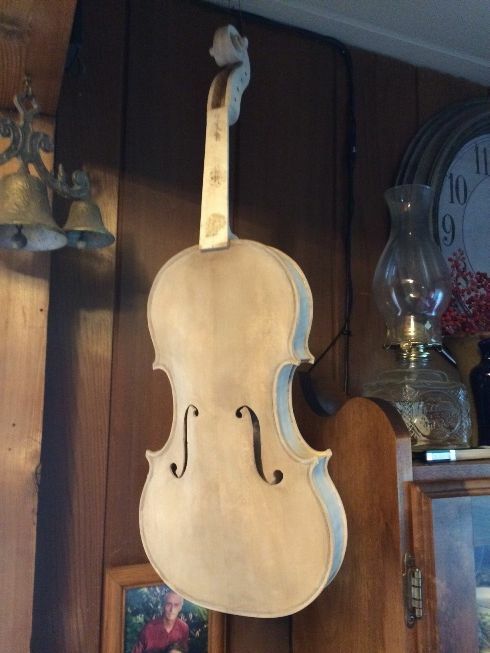 Next, I need to cut out the f-holes, and add the bass-bar. I do realize the corners are too long…I will trim them later. 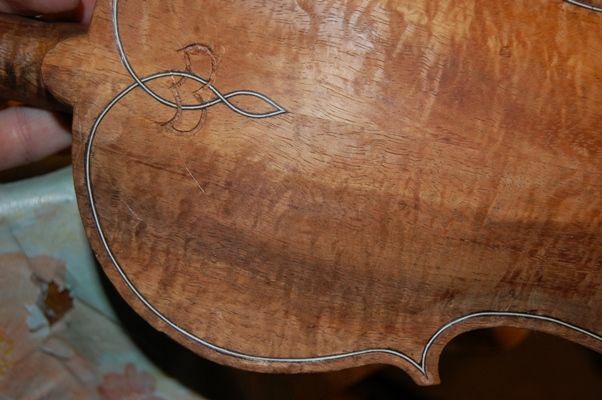 One thing I decided on this instrument was that I should begin the coffee staining very early, so that, if there is any distortion, due to the wetting of the wood, I can correct it before the plates go on the garland. In this photo, it is hard to see how much the grain is raised, but, those wide summer grains of the Sitka Spruce are all swelled up like corduroy! Accentuated grain lines, due to coffee stain. I will let it dry, and then gently scrape it smooth again. The issue, here, is that the summer grain swells more than the winter reeds, but when we scrape the wood, the summer reeds compress, while the winter reeds resist the blade and are cut away. The result is that the summer reeds are already raised, even before I wet it down and deliberately raise the grain, before leveling it again. When the plate is nearly perfect all over, I will finish cutting out the f-holes, and finish their edges as well as I can. I nearly always see something later that I have missed, so I just accept the fact that I will be making corrections right up until the time I begin varnishing. The same thing applies to the scroll. It will never be “perfect”, and I accept that. I will lay out and fit the bass-bar, trying for an air-tight fit between the bass bar and the inside of the front plate. 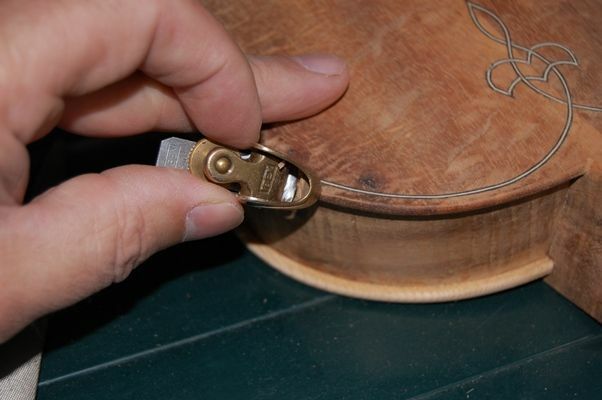 I install it using hot hide glue and clamps, but will trim it to the proper shape after the glue is dry. 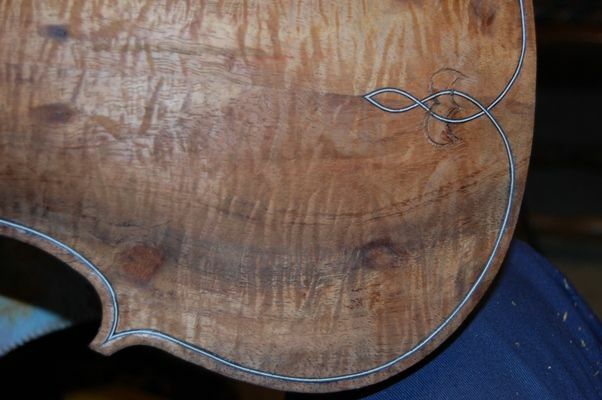 After the bass-bar is fully completed, I round the inner edges of the front plate, so that it is ready to install on the garland. All of the above was accomplished three weeks ago, before we left on vacation, so it should have been published then, too…but I kept thinking I would get a little more done before we left, so it simply did not happen. We are back, and progress is once again happening, so I will post more in a day or two. An apology in advance: as I warned some time ago, I have a tendency to get out of “photography mode” and just pursue the tasks at hand, then suddenly realize that I was supposed to be doing “show and tell”. So, (sigh…) this time it will be more “tell” than “show.” But I do have some photographs of the tools involved. Tool for scribing the crest of the edge. There is a collet-style pencil lead held in place, there. 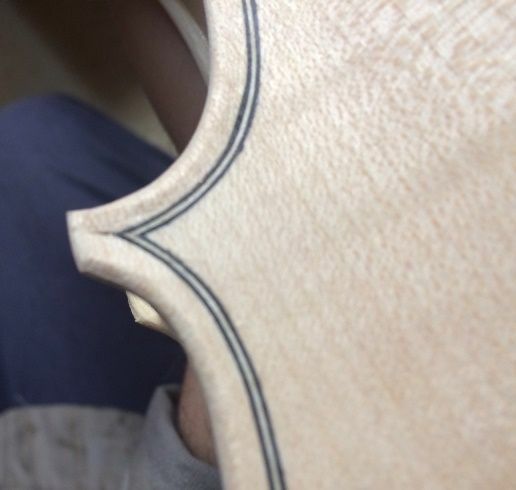 That marks the outer edge of the channel, as well as locating the crest of the finished edge. 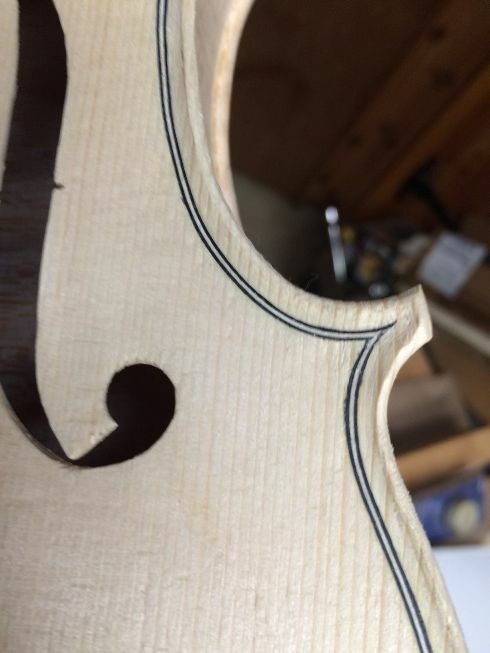 I extend that line at the same distance from the purfling at the ends, so, at the ends I have two lines: one forms the crest of the edge, the other the edge of the channel. The dark Koa wood did not easily show the pencil mark, so I had to scribe firmly, and usually several strokes. 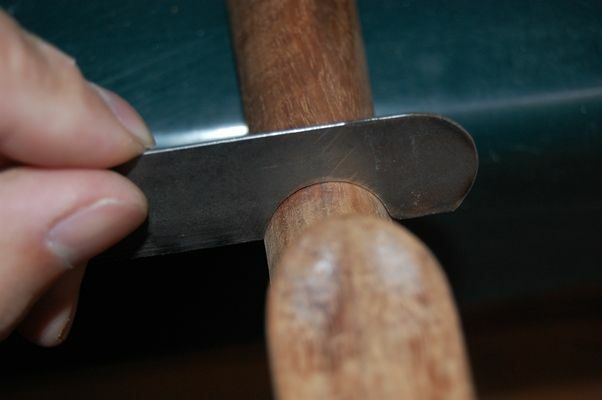 I then cut the channel with a sharp gouge, trying to keep it shallow, but following the scribed line all the way around. 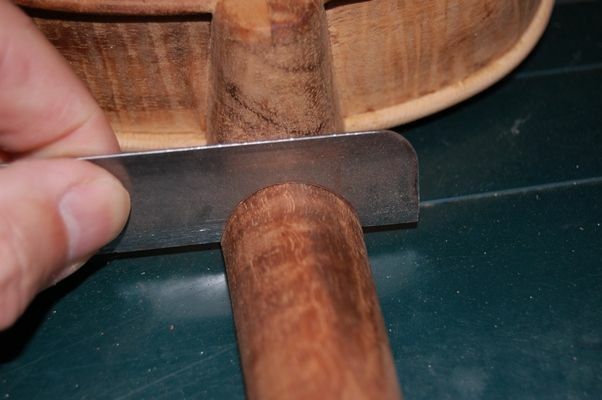 I used a larger gouge for the upper and lower bouts: a smaller one for the C-bouts. 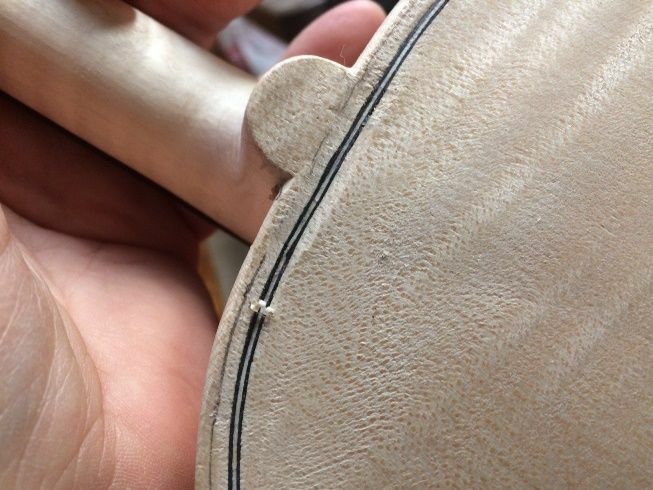 Larger gouge for upper and lower bout channels. Then I used scrapers to “fair in” the channel with the curve of the arching, and make sure there are no humps or hollows. Smallest radius scraper. 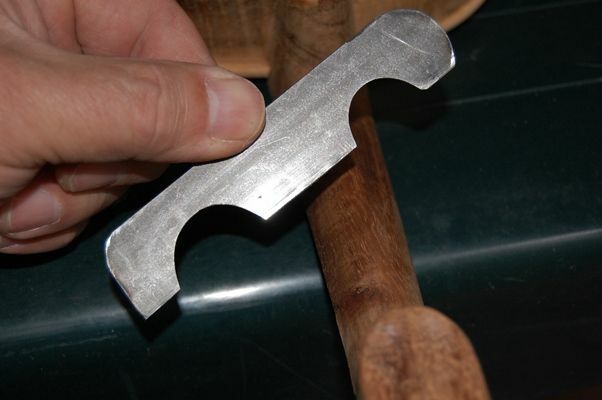 This one has a long flat edge, a long curved edge, and both ends have a very small radius. Flat scraper for final fairing-in of curves. Finally, I use a tiny plane and a file to shape the outer edge, curving smoothly from the scribed “crest” to the outer edge, where, hopefully, it will smoothly join the curve from the inner edge. 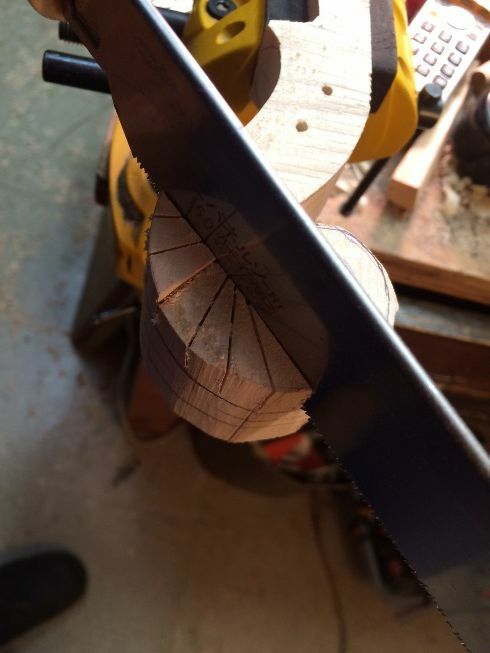 Planing the outer edge curve. 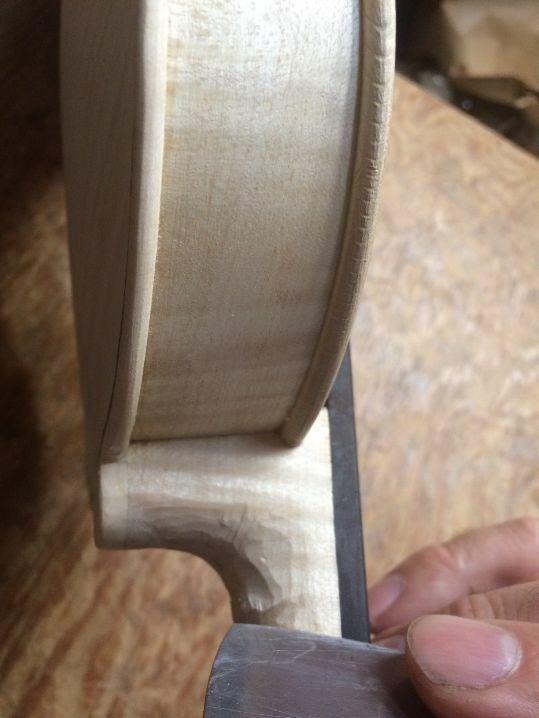 Filing the outer curves smooth. 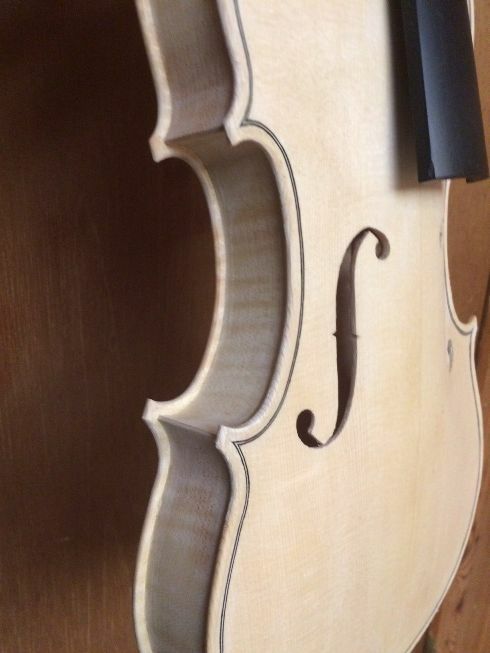 I also double-check the scroll and neck shape and contours. They must be scraped to perfection before I can move on. 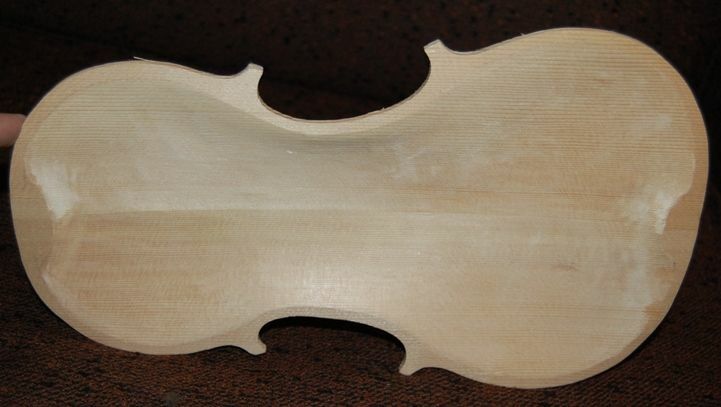 I use a template (copied from Henry Strobel’s books) to check the upper and lower shape and size of the “handle” portion of the neck, and then try for smooth transitions between the two. 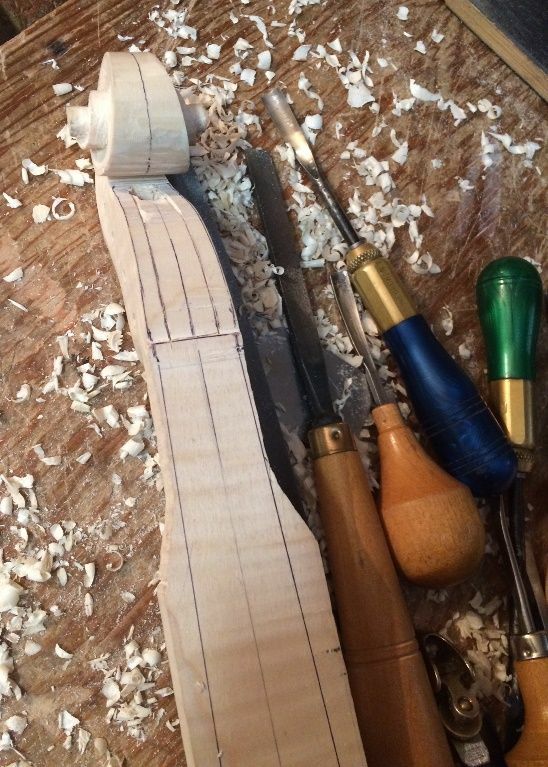 Neck template for upper and lower neck cross-sectional shapes. Upper neck shape with template. 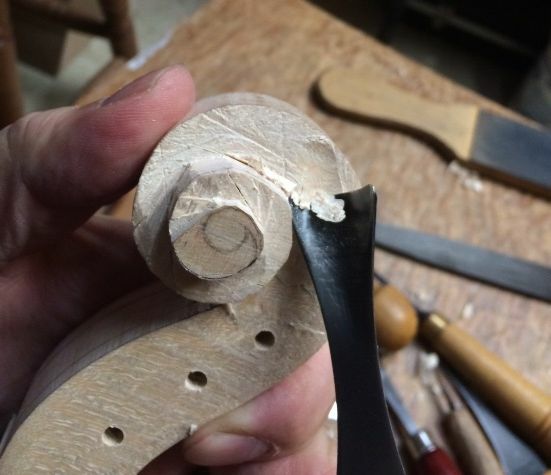 Scraping the transverse curve in the volute. At last I am ready for final varnish preparation. Everything has to be as perfect as I can get it, because every imperfection will definitely show up under the varnish. The tiniest blemish will show up like a neon sign once I begin the varnishing. Some people insist on only using scrapers, but at this point I feel fine about using very fine (400-grit) abrasive paper to remove the tiny blemishes. Pretty much ready to varnish. Looks pretty plain at this point, doesn’t it? 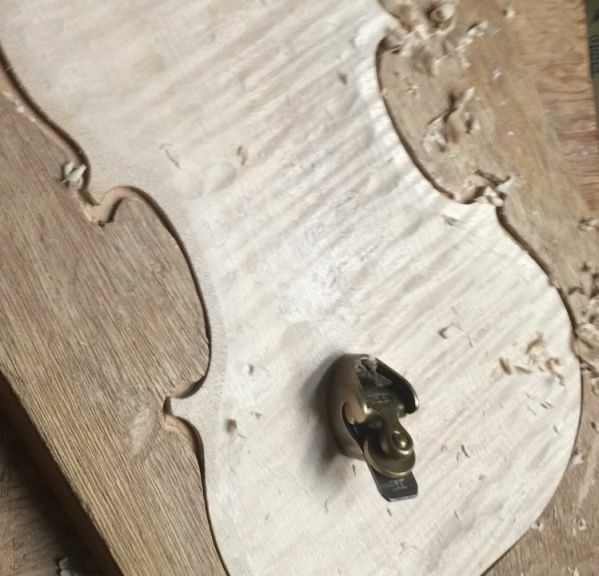 I removed the fingerboard for varnishing…it was only temporarily glued in place, originally, to aid in the neck setting procedure. 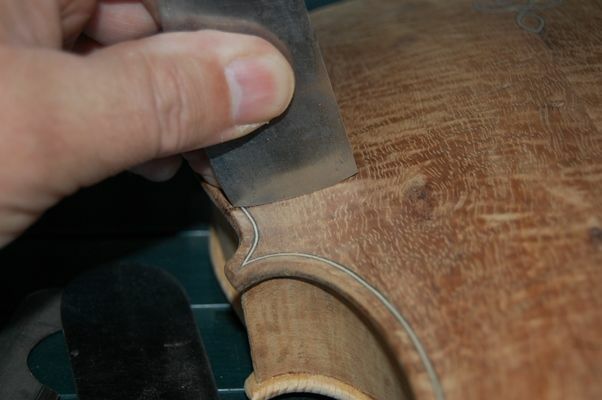 While varnish is drying, I will shape the underside of the fingerboard, and lighten it, to enhance tone and projection. 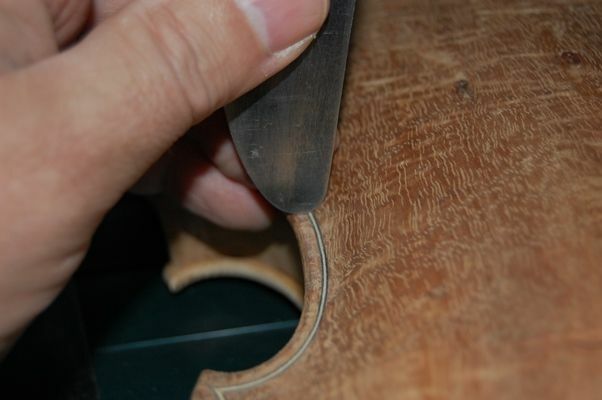 After the varnishing is completed, I will glue the fingerboard permanently in place. 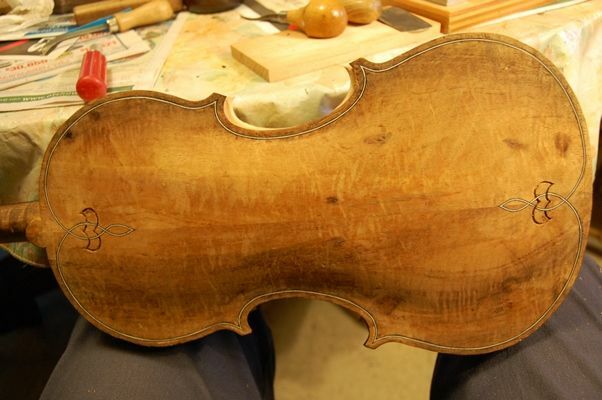 I will also install the saddle, nut and pegs after varnishing. 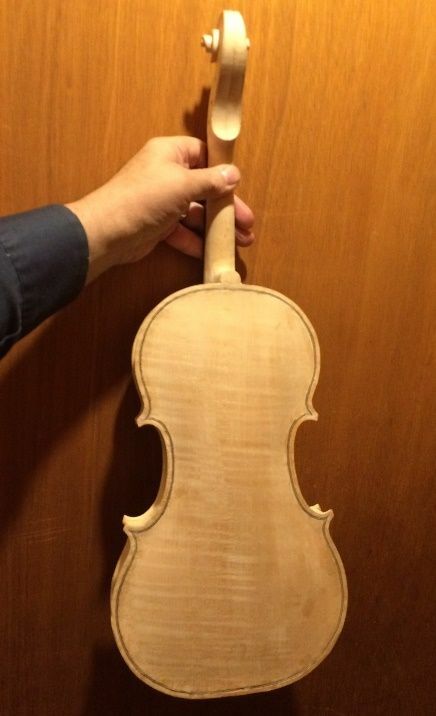 At that point, the violin will be essentially complete, and set-up is all that remains. So: I’m sorry I missed the “in progress” photo opportunities, but, from here on out, it will be just progress reports in finishing. The mineral ground is next, and then the sealer.